Dragon fruit, also called pitaya or pitahaya, is the vibrant-colored and sweet-tasting fruit of some cactus plants. It is relatively easy to grow, particularly for those in tropical or subtropical locations where maintenance is minimal. It can also be container-grown for those in frost-prone regions. Dragon fruits are in no hurry to ripen, with maturing times ranging from 45 to 150 days. The fruits have scales on their outer shells, and the flesh is custardlike and pleasant. Small black seeds dot the inside of the flesh. Selenicereus fruits are yellow with white flesh. 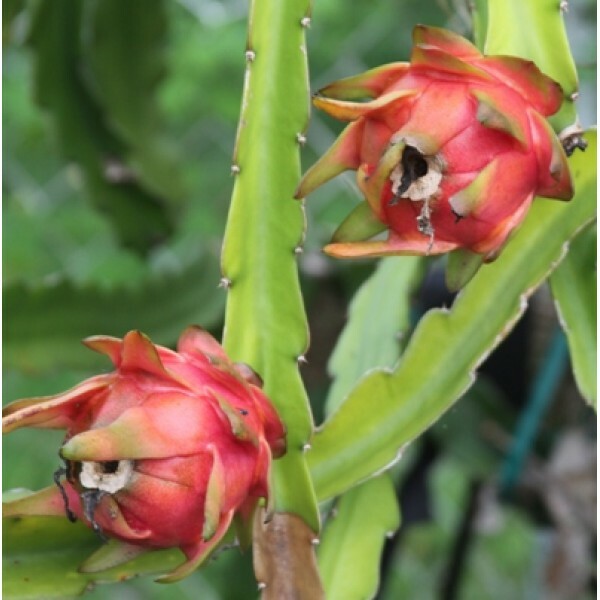 Hylocereus is generally a hot pink or red color with white or pink flesh. Dragon fruits can grow very large, weighing up to 2 pounds at full maturity. Fruits with pink flesh tend to be sweeter than those with white flesh, regardless of the variety. Like most cactus species, the dragon fruit prefers very warm conditions and cannot survive below 28 degrees Fahrenheit. It performs well in USDA zones 10 and 11 but may need to be protected from frost in zone 9. While they enjoy full sun, they can get sunburned and need occasional shade, making it best to plant them where they will be shaded by other structures or plants for a small portion of the day. They enjoy well-drained soil high in organic materials and have an affinity for soil containing saline.